Diner en Blanc...Are You In? It was 5:04pm when I received the text notifying me of the location for this year’s Diner en Blanc. We were to report to Gate 2 at Mercedes-Benz Stadium. Wait . . . the newly constructed Mercedes-Benz Stadium? Perfect!! I was less than 15 minutes away enjoying drinks with my blogging partner, Rochelle Wharton of Culinary Vegg Out. We would be part of the digital media covering Diner en Blanc. We left P.S. 404 to head to the festivities. As we drove up to the stadium, all I could see was a courtyard engulfed in a sea of white. As each bus allowed guests to disembark, it became wave after wave of white descending upon the stadium. Have you ever seen a sea of white created by people? It was a magnificent sight. After parking we make our way to gate 2, where we obtained media passes for ourselves and our guests, Paris Coburn and Dionna Collins. From there we were guided in the direction of the media lounge. Walking through the gates there were people bustling to and fro claiming their space in the courtyard, setting up their tables and chairs. This view of the white sea resembled choppy waters before a storm. So much movement!! Some people pulled wagons while others toted bags. Some were very creative with the way they transported all their Diner en Blanc needs. In the midst of all this choppy water, I began to see where the vision was heading. During the setup there was music played by a live orchestra and cirque style performances throughout the venue. Once at the media lounge I got to finally meet the face behind the emails, Ms. Lisa Fisher. As one of the three hosts for Diner en Blanc Atlanta, it was great to be able to put a face to a name. The media lounge was wonderful, decked out in all white sofas, white tables and white chairs. We had our own bar and a lovely spread for us to nosh on. We were able to network with other media outlets and reacquaint with others met at previous events. And then it was time to go to work. Time to share through my social media platforms all things Diner en Blanc. When I looked out into the courtyard again that once choppy sea of white had simmersed to a lull with light ripples caused by a few late comers. It was beautiful to see how the table settings came together with the people seated all around dressed in white. The sight was brilliant! To signify the start of Diner en Blanc there is the traditional waving of the napkins. You can catch a glimpse of it here. The party was now under way. There was a live band and a male vocalist, not sure of their name. I somehow missed it amongst all of the fun being had. There was a guitarist who performed with some of the aerialists of Liquid Sky Entertainment on stage with him. It was great. Then DJ Grace Lamour took to rocking the crowd. People danced the night away. There were plenty of photo ops available for attendees. There were two beautiful white Mercedes-Benz cars, a photo booth with the Diner en Blanc backdrop, the stadium with the great Falcon Sculpture and let’s not forget the lighted letters of Diner en Blanc for people to choose from. The sea of white was taken a step further later in the night when another tradition took place, the lighting of sparklers. Here is a small glimpse of the stars above the sea, a grand sight to see. Let me stop rambling on and share some of the pictures from the night. All told Diner en Blanc was a breathtaking event. I was sad to see it come to an end but I am super excited thinking about the 2018 edition. 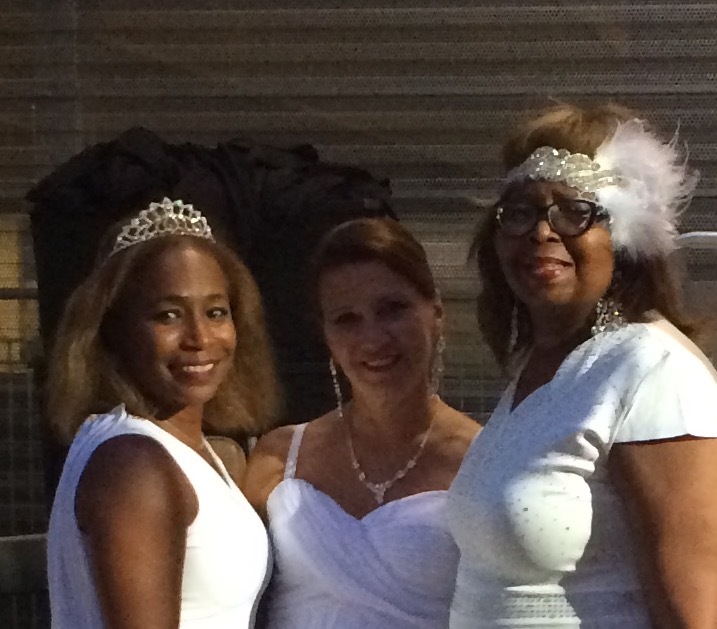 Diner en Blanc Atlanta was made possible by the diligent efforts of our gracious hosts Lisa Fisher, Tina DeRenzis and Helen Mitchell, who produced a memorable event. Thank you to Mercedes-Benz Stadium for a wonderful location. Special thanks to Diner en Blanc sponsors Lanson Champagne and Evian-Bedoit who provided the drink options for the night. And let’s not forget all the people who attended. Without them how would I have been able to experience such a stunning sea of white. I look forward to what this team has to offer everyone for the 2018 Diner en Blanc Atlanta. I made so many memories that night. So many that I wouldn’t know where to start or end. I hope this post makes you want to participate next year. 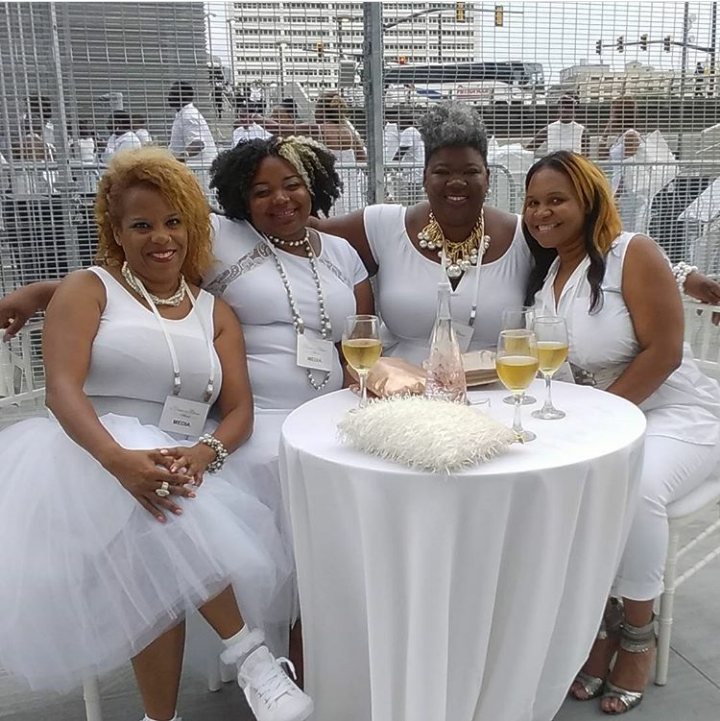 Stay in the know for Diner en Blanc Atlanta 2018 at atlanta.dinerenblanc.com. Now go forward and make new memories. It was my pleasure to greet you at Gate 2 and guide you to the media lounge! Diner en Blanc…Are You In?